It’s only been a couple of episodes since it appeared that Jimmy was all but done due to his brother Chuck and his machinations, but last episode we got a hint that things might not be as out of control as we suspected. In addition, we get to see the direct fallout from Mike’s actions last week, as well as get a tasty little flashback explaining a fair bit about the rivalry between Hector Salamanca and Gus Fring. Scroll down to read my episode synopsis and review. 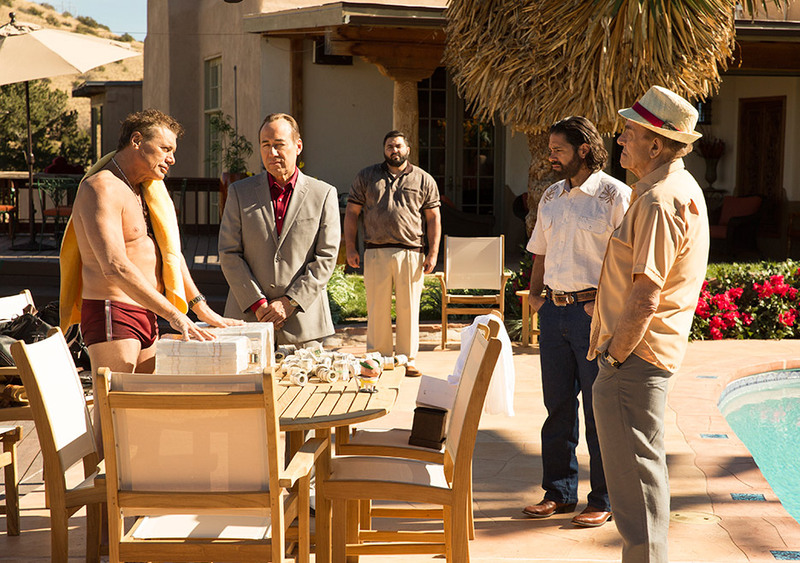 The episode opens with a flashback to the early days of Fring’s work with the cartel. We’re at Don Eladio’s home, and a young Hector tells him about his new business, which he’s named The Winking Greek after Eladio. He presents the Don with a bobble-doll of the company’s mascot, Sabrosito, and a bag full of cash. Eladio mocks him mildly about the doll, but is happy with the money. That’s when Bolsa, Fring’s contact, joins them. He too has a present, a Los Pollos Hermanos t-shirt. Neither Eladio nor Hector seem particularly impressed…until Bolsa whistles over his man, who brings three bags stacked full of cash. Eladio is impressed. His mocking of Hector gets nastier, telling him that Fring is “larger” than him, and requiring that in future, all money brought to him must be neatly packaged like the money Bolsa has brought – no more rubber bands, he directs. As he and Bolsa go inside, Eladio putting on the t-shirt as they go. Hector stands outside overlooking the swimming pool, silently fuming. We jump to the present day, where we see the DEA raiding the main offices of The Winking Greek in Albuquerque. Mike is off in the distance, watching the results of his handiwork from last episode. By implicating the one van, he’s brought down Hector’s entire importation business. He calls his daughter-in-law to ask how things are – he’s been avoiding her and his granddaughter since he moved them to avoid Salamanca’s retribution, so he’s finally feeling secure enough to reenter their lives. We get a nice moment where he goes to their house, and shares a relatively normal evening of watching TV and eating dinner. These moments are few and far between for a person like Mike, and you can see that he really enjoys the visit. 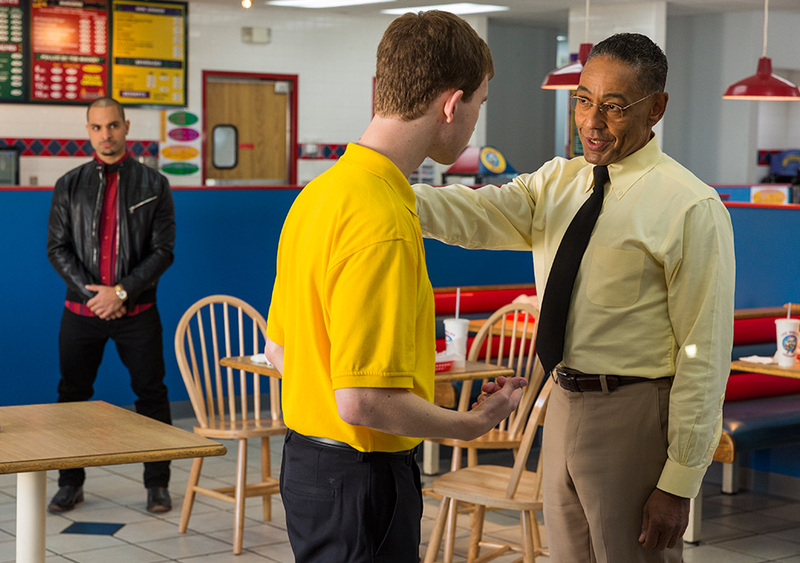 The next morning, Hector goes to Los Pollos Hermanos with Nacho and his other gunman, Arturo. They disrupt the business and frighten both the customers and staff, as Hector demands to see Fring and won’t leave until he does. He lights a cigar, walks behind the counter, and sits in Fring’s office. Fring is at a local Fire Department, receiving accolades for his financial support (and for his chicken! ), when he gets a call from the restaurant. “I’ll be right there,” he says. Arriving at the restaurant, he finds all of his staff sitting in the dining area, with Nacho and Arturo watching over them. He tells them all to go home – Lyle, his Assistant Manager, asks him if he’ll be alright on his own, and Fring is gracious but insistent. Going back into the office, he gives Nacho a long-suffering look, and then speaks with Hector. He’s angry, but controlled – he reminds Hector that though he works for the Cartel, the business is his own, and is legitimate. He accuses Hector of putting everything at risk by coming to the restaurant and making a scene. Hector could care less. He tells Fring that he is the Cartel, and that he has big plans for Los Pollos. His business and smuggling scheme unraveled, he tells Fring that the Los Pollos trucks will be carrying the extra load. Fring protests that his trucks are at capacity, but Hector doesn’t care – he orders him to find a way. Hector leaves with his goons, and Fring slowly begins to clean up the restaurant on his own. And he begins to smile. Mike’s actions have delivered him exactly what he wanted: a bigger share of the pie, and a damaged and decreased Hector Salamanca. Later (likely the same night), we see Mike at his parking lot job. An SUV rolls up, and the window rolls down – it’s Victor, and he tosses an envelope into Mike’s booth. 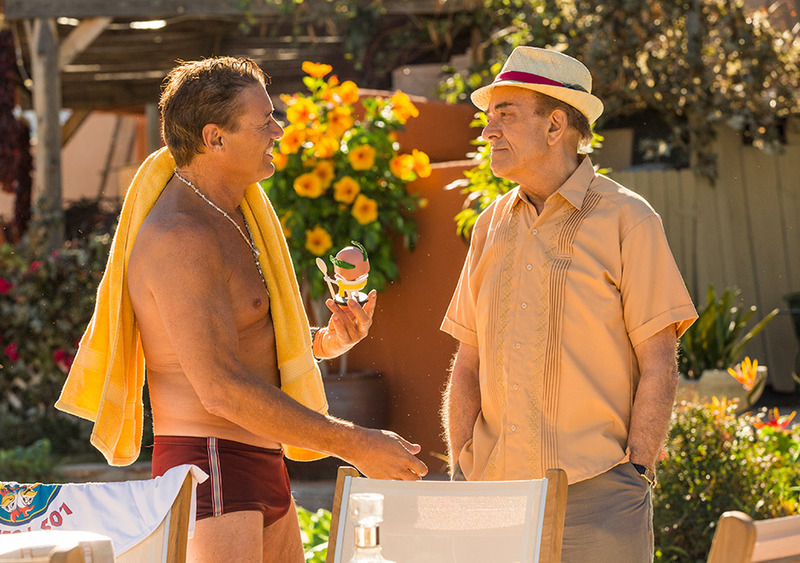 When he pulls around to the exit, Mike tosses the money back to Victor. “Tell him we’re square,” Mike says, and closes the booth window. 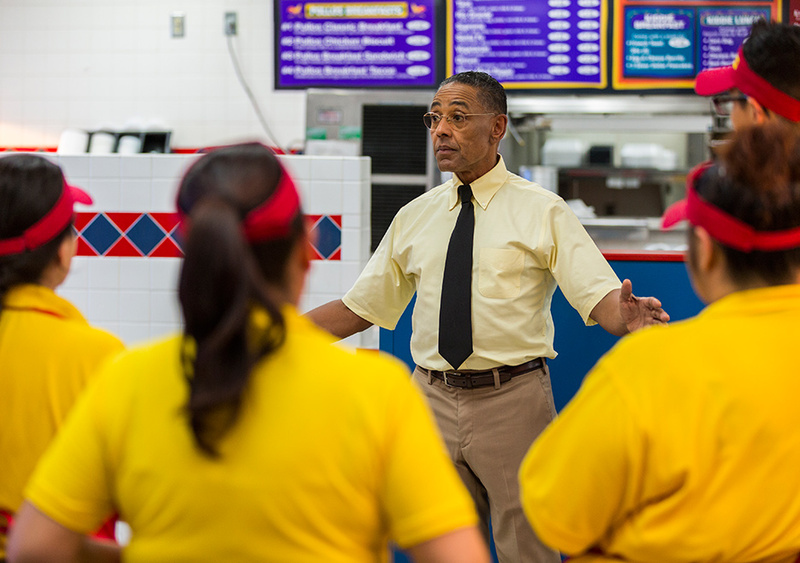 The next morning, Fring shows up at Los Pollos Hermanos, where his workers are busy getting prepared to start the day. He sees them eyeing him out of the corners of their eyes, so he calls them all together. He “explains” who Hector and his men were. He spins a tale of them showing up years earlier at his Mexican branch, extorting protection money from him. he tells them they came here for more, but he decided that, “No. No. This is America.” He gives a rousing speech about the freedoms they need to protect, about what it means to be American, and every one of his workers laps it up. He’s at his most charismatic – in this moment, you can see that Fring commands such loyalty from his men not just because he’s a dangerous killer, but because he’s urbane and charming as well. He is, in every way, the polar opposite of Hector and his way of doing business. We go to the offices of Wexler and McGill. Kim is blind-calling repairmen, trying to find who has the job of fixing Chuck’s broken door. She gets a hit, and then cancels the appointment. Going to Jimmy’s office (we get a brief glimpse of Francesca making small talk with one of Jimmy’s elderly clients on the phone), she hands him the information. He’s busy writing his confession for the Pre-Prosecution Deferral (PPD), and he asks for her opinion on the wording. She suggests he changes the word “destroyed” for “damaged” regarding his acts. He thanks her. She asks him, “Are you sure you’ve got the right guy for this?” “The creme-de-la-creme,” he replies. Sure enough, when the appointment time rolls around, it’s Mike at Chuck’s door. 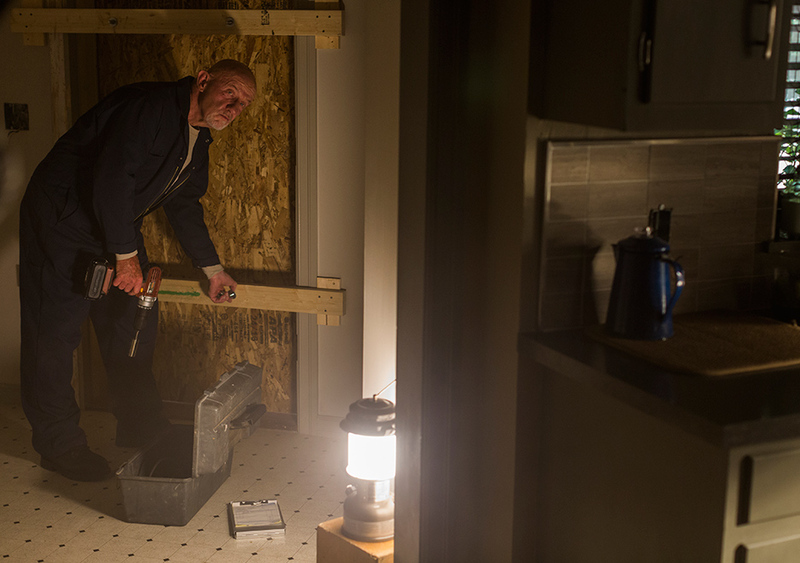 My first thought – going back to memories of Breaking Bad – is that he was going to bug Chuck’s house. But no, his plan was much simpler. Looking at the damaged door, he asks Chuck where the power outlet is so he can get started. Chuck looks surprised, and tells Mike that there’s no electronics allowed in the house, as per his instructions. Mike gives him a shrug, and pulls out a rechargeable drill, which he starts to use immediately. Chuck cringes and pulls back, and tells Mike that it won’t do. Mike gives him the deadeye, and says, “Turns a morning job into a two day between me, myself, and Ben Gay.” Chuck caves, and moves upstairs to avoid being close to the electronics. Mike keeps revving the motor until he’s sure Chuck is out of sight. He then begins to take pictures of the door and the office, running the drill the whole time. Later, he meets with Jimmy and gives him the pictures. Jimmy’s happy with them, though he can’t help himself from making one small complaint about the composition of the photos (“At some point we should probably discuss the rule of thirds”). He’s particularly happy with one shot that shows a gas lantern on top of a pile of Financial Times. Jimmy asks him for “the other thing,” and Mike produces a piece of paper with some writing on it – he got the information from Chuck’s address book, but neither of them say out loud what exactly the information is. They agree that they’re even now, and Jimmy leaves. That night back at the parking lot, Fring’s Volvo station wagon rolls up, and he asks if he and Mike can talk. “You sent back the payment we agreed upon,” Fring says. Mike tells him that he wasn’t doing what he did for Fring, and that he’s “just glad to have Salamanca out of my head.” Fring appears impressed with Mike, and this is confirmed when he says, “Well perhaps in the future, you will consider working for me.” Mike looks off to the side, but nods his head a bit. “Could be. That would depend on the work.” Fring asks him, “Do you care to know why I stopped you from killing Hector?” Mike looks a little surprised. “Like you said, it wasn’t in your interest.” Fring sets his mouth in a thin line. “A bullet to the head would’ve been far too humane.” He walks back to his Volvo and drives off. 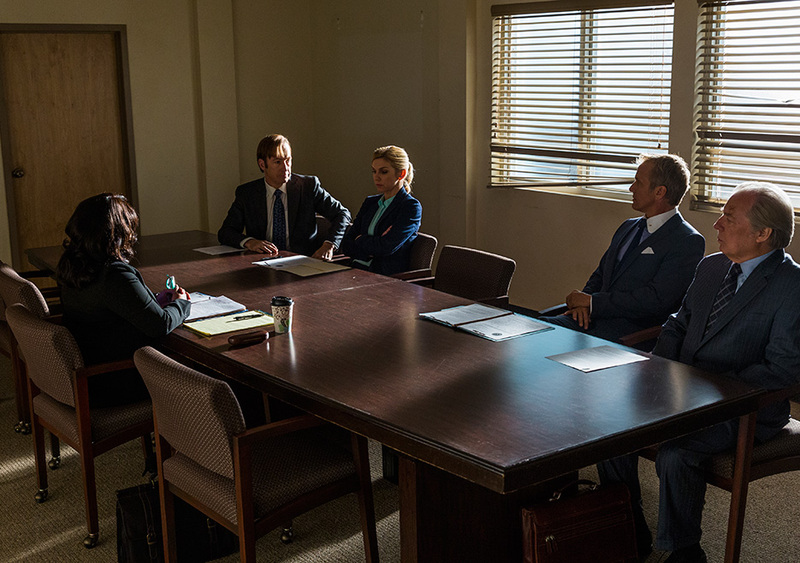 The episode ends in the courthouse, where Jimmy is sitting alone in a boardroom. Hamlin walks in and greets Jimmy, turning off the lights and heading to the table. Chuck follows, and then Kim, and finally the ADA we met last week, Kyra Hay. She’s immediately and unapologetically sympathetic to Chuck, asking after his comfort, and telling him a personal anecdote about a family member who was also hypersensitive (interestingly, she was hypersensitive to choir boys singing, which is appropriate seeing as how everything Chuck says to Hay is basically singing to the choir in any case). Chuck and Hamlin want one wording change to the confession – predictably, they want the word “damaged” changed to “destroyed.” They’re really insistent on somehow getting the tape mentioned by name on the document, and they do succeed in doing so by including it on the damages payable at the end of the document. This is so obviously a ploy by Chuck and Hamlin that it’s almost pathetically played. The nadir of the meeting comes when ADA Hay insists that she sees no remorse in Jimmy, and demands that he make a verbal apology to his brother, also reminding him in the process that she is a member of the New Mexico Bar Association, and she won’t be looking kindly at Jimmy’s behavior. She’s already made up her mind. It’s an interesting moment, and again it feels as though Chuck is in collusion with her. Everything about his and Hamlin’s behavior during the meeting is intended to grate on Jimmy’s nerves, trying to provoke him, but to his credit, Jimmy keeps it together. He apologizes to Chuck, but much of the language is clearly double-edged, terms such as “No one should act that way toward a brother” meant to reflect on the way that Chuck set him up from the beginning. After apologizing, Jimmy walks out. As Chuck and Hamlin leave, Kim confronts them. She warns them that they will be fighting the admission of any tapes Chuck still has at the Bar hearing. Hamlin feigns ignorance, but Kim insists that she knows they made a copy, seeing as how they’d set the whole thing up to catch Jimmy in the first place. Chuck tells her, as Hamlin tries to shush him, that Jimmy actually destroyed the copy, and that the original is safe under lock and key – he’ll forward her a copy of it when it is admitted into evidence for the hearing. Chuck is so completely smug in this moment that I’m surprised Kim didn’t just smack him – but she’s even more under control and cool than Jimmy. She leaves the two men and walks toward the exit, meeting up with Jimmy a couple of turns away. He falls into step beside her. “Well?” he asks. “Bingo,” she replies. The two of them straighten up and walk out the exit, confidence in every stride. This physical manifestation of their mental state is both subtle and understated, but is a perfect ending to the episode. Yes, the situation was created by Chuck’s manipulation of Jimmy, but it is clearly Jimmy and Kim who are solidly in command by the end. This was a great episode. Tons of things happened, characters were developed, and we get the actual moment when Fring suggests – if not quite begins – his professional relationship with Mike. I’m liking Kim’s character more and more, and I suspect that, save for perhaps Fring, she may be the smartest character in the show. She’s certainly got it over Jimmy, and her masterful handling of both of her former bosses in Chuck and Hamlin made them out to look like a couple of stupid frat boys caught with their hands in the cookie jar. The fact that Chuck is so completely confident in his position that he’s willing to basically wave the red cape in Kim’s face shows just how completely out of her league he actually is in this situation. 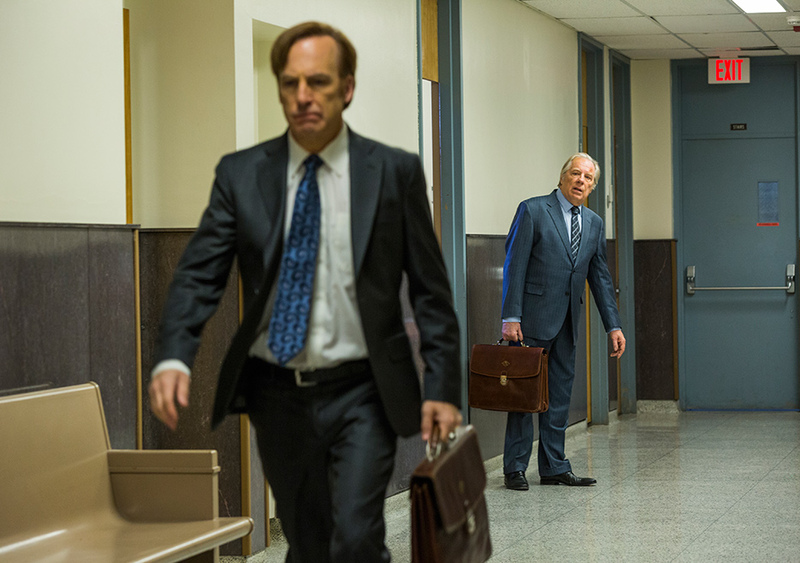 While the overarching story of the series is going to be the fall of Jimmy McGill (and the concurrent rise of Saul Goodman), I sense that this season is going to be about the fall of Chuck McGill. While we’ve seen Jimmy over-reach on several occasions, he’s always managed to recover. I don’t think Chuck has the same resiliency – he’s simply far too confident and sure of his own righteousness, that he can’t even see how far he’s falling, or how actually immoral his actions have become. The Mike and Fring show was an excellent part of the episode, taking up a little more than half the time tonight. Fring is clearly not going to be a part-time addition to the series, and his burgeoning relationship with Mike is developing a firm foundation based on mutual respect. When we meet the two of them in Breaking Bad, there is clearly more than a simple business relationship between the two men, and it is going to be interesting to watch them get to that point here. There were many fine touches in tonight’s episode as well. It’s the little things that show through, that show Gilligan and Gould’s attention to detail. For example, the fact that Mr. Careful himself (Fring) drives a Volvo is no mistake whatsoever. Of course he drives a Volvo. And of course it’s a late model. A Subaru or newer Volvo would be too ostentatious for his tastes. The bobble-head that Hector brings to Don Eladio in the opening flashback shows us that Hector is a poor judge of character, and that he lacks both taste and subtlety, setting him up as the perfect foil to Fring’s urbane and careful malevolence. And finally, Jimmy falling into line for Kim shows that he is, in fact, a good judge of character, not least of all his own. 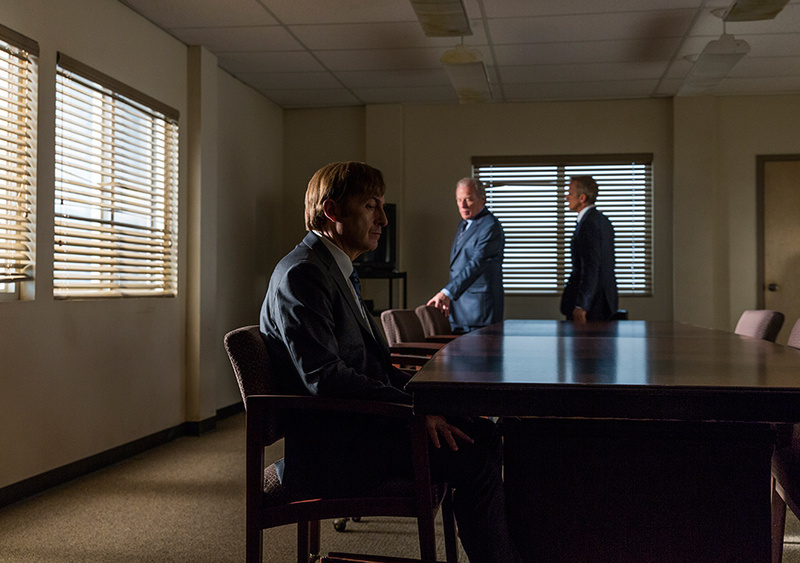 Three excellent episodes in a row suggest that this may be the most polished and successful season of Better Call Saul so far.